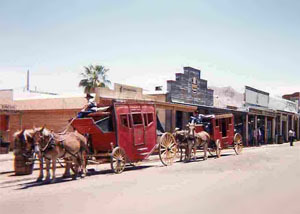 Like a mustang, Tombstone—Arizona’s “Town too Tough to Die”—was born on its feet. 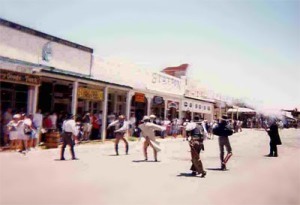 Silver built the town in the 1870’s in Apache country and silver still drives it … Apache silver and tourist silver. #3 Russell’s Roadrunner – and pick yourself out a Western hat. The store opened in 1865 and has been selling to dudes and townspeople ever since. Choose firm and fancy felt or flirty, fly-whopping straw. Prices are anywhere from $17.95 on up to… well, it depends on how dudified you want to get! #5 Six-Gun City – (make sure you get one of those coupons they hand out on the street corners) home of the $2 margarita, where you can pan for gold while eating your ice cream. They’re on Toughnut, too. #6 Bird Cage Theatre – where you can scare yourself silly in the creepiest, most interesting theatre, saloon, bordello and gambling establishment on this planet. Directions: From Tucson, head south/east on Interstate 10, turn south on Highway 80 at off-ramp 304, mind the speed limit through St David and pedal straight on to Tombstone. You’ll pass Boot Hill – just sayin’ – and then be on Fremont Street. At this point, best parking is usually a right turn on 6th and a block down near the high school on Allen. East/west streets are normally blocked to traffic. You may want to locate the restrooms—one set just across the street is not always open. The other is diagonally across at the other end of Allen, in a nice little city park.